If a cobbler is for family gathering then fancy pies are for company and holidays! (or winning Blue Ribbons!) Any which way a you make a peach pie is okay. 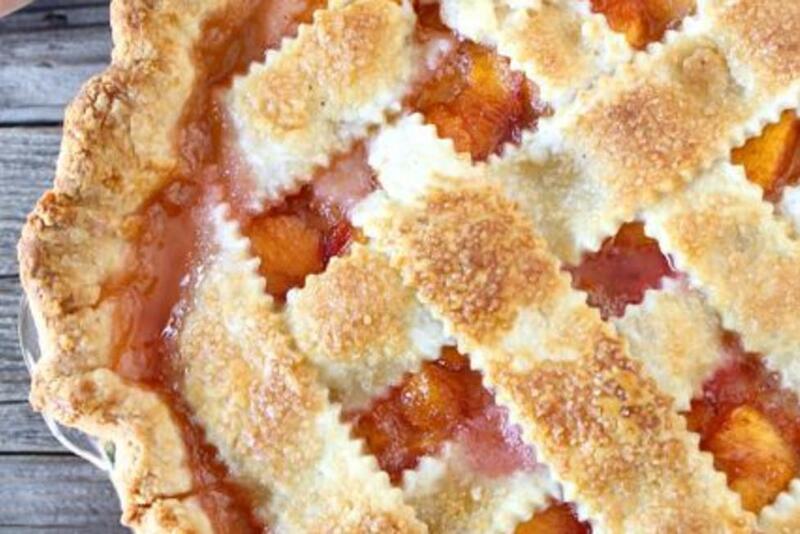 You can&apos;t beat a slice of homemade peach pie. Go all out and add a scoop of vanilla ice cream for dessert perfection! 1. Combine the flour, sugar, and salt in a bowl. Add the cubed butter and toss to coat. Dump the mixture out onto a clean surface and use a rolling pin to roll the butter into thin sheets, combining it with the flour. Use a bench scraper to scrape the rolling pin and to bring the mixture back into a pile as necessary. Continue until all of the butter is incorporated into the flour. Mixture will be very flaky. Return mixture to the bowl and place in the freezer for 15 minutes to chill the butter. 2. Remove from freezer and add the buttermilk. Use a spoon and then your hands to stir the mixture until it comes together into a ball. If mixture is too dry, add the water a tablespoon at a time. Divide the dough in two and flatten into disks. Wrap each disk in plastic wrap and chill in the fridge for at least 1 hour. 3. While the dough is chilling, make the peach pie filling. In a large bowl, combine peaches, sugar, cinnamon, nutmeg, cornstarch, and vanilla extract. Gently stir until mixed well. 4. When ready to roll out, let the dough rest at room temperature for five minutes. On a lightly floured surface, use a rolling pin to roll out the dough into a rough 13 inch circle. Dough should be about 1/4 inch thick. Transfer dough to pie dish. Fill pie with peach filling. Repeat with the second disk of dough. Cut dough and make a lattice over the filling. You can also leave the circle intact and cover the filling completely, cutting a few vents with a sharp knife. 5. Fold the edges of the top and bottom crusts together and use your index fingers and thumb to pinch into a pattern. Brush with egg wash and sprinkle with turbinado sugar. 6. Bake in a 400 degrees oven for 45 minutes or until the pie is bubbling and the crust is golden brown. Let the pie cool completely on a wire cooling rack before cutting.